From gorgeous red carpet glam to epic performances, the 2018 MTV European Music Awards were a spectacular, drama-filled evening. Taking place in Bilboa, Spain on Sunday, Nov. 4, 2018, it was hosted by Hailee Steinfeld and featured epic performances by all of our favorite artists — Jack & Jack, Bebe Rexha, Little Mix, Janet Jackson, Anne-Marie, Marshmello, Bastille, Jason Derulo, David Guetta, Nicki Minaj, and more! Besides the amazing lineup of performers, the red carpet looks were also to die for. Some of the best included Debby Ryan‘s super cute pants suit and Camila Cabello‘s fiery red dress, but all the outfits were certainly on point. BTS, who didn’t attend the awards, beat out Camila, Selena Gomez, Shawn Mendes, and Taylor Swift for the Biggest Fans award. 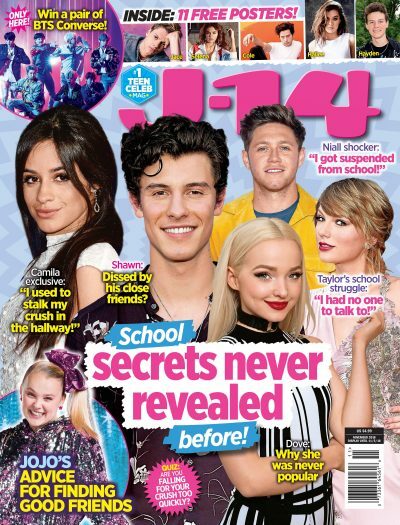 The award show was certainly a night to remember, and J-14‘s rounded up the best looks and the top moments from throughout the star-studded night. Scroll through to find out who took home all the awards and who stole the show! Alessia Cara, who won Best World Stage looked adorable on the red carpet in black pants and a leather jacket. Ashlee Simpson melted our hearts when she showed off some adorable PDA with her hubby Evan Ross on the red carpet. Jack & Jack performed their song “Rise”, where the two floated above the stage with a whirlpool, black hole-looking-thing in the background. It was certainly a cool performance, and not to mention they looked absolutely stunning on the red carpet in tuxedos! Lindsay Lohan had all eyes on her in a brown, ruffled dress which she paired with black heels for the fun night. Bebe Rexha, who went all out with her performance of “I’m a Mess” and had over 100 dancers, sparkled on the red carpet. Nicki Minaj also hit the stage to perform, singing her hit “Good Form” flawlessly before being joined on stage by Little Mix for an epic performance of their new hit, “Woman Like Me.” Not only did the ladies own the stage, but they also slayed the red carpet as always! Hailee Steinfeld absolutely killed it as the award show’s host and a performer! She sang her newest hit, “Back To Life,” which is featured in the new movie Bumblebee. The actress and singer who’s currently dating Niall Horan, performed the song while being spray painted by robots! Camila Cabello was the night’s biggest winner taking home four different awards including Best Artist, Best Video, and Best Song! She looked flawless in a red, long dress. Dua Lipa, who took home the award for Best Pop looked gorgeous on the red carpet in a short floral dress. Some other award winners included Cardi B, Nicki Minaj, Shawn Mendes, 5 Seconds of Summer, and Grace VanderWaal! Halsey‘s raw, emotional performance of “Without Me” (as well as her gorgeous red carpet style) left us shook to the core. Debby Ryan rocked a striped ensemble for the glamorous event.